This St. Patrick’s Day-themed bin was a result of what happens when you need an activity pronto that takes less than a minute or two to set up and will keep toddlers occupied for at least a half hour. 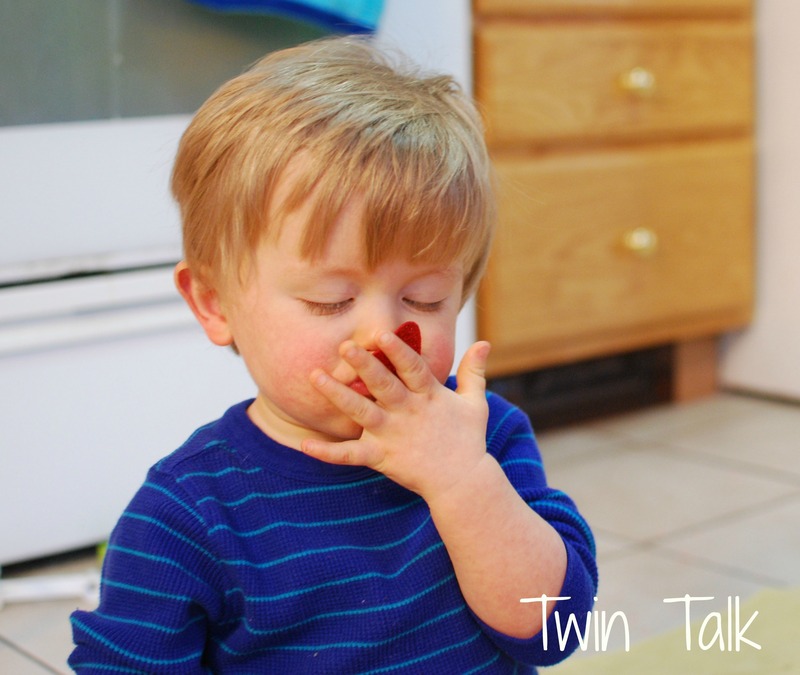 I find myself scouring Pinterest and other blogs often for ideas on what we could do with the twins. But sometimes, it’s the simple things then lend themselves to the perfect activity – no trips to the store needed! With all the sensory bins we’ve done lately, I never even considered the obvious soap and water. In fact, I didn’t think of it this time either. 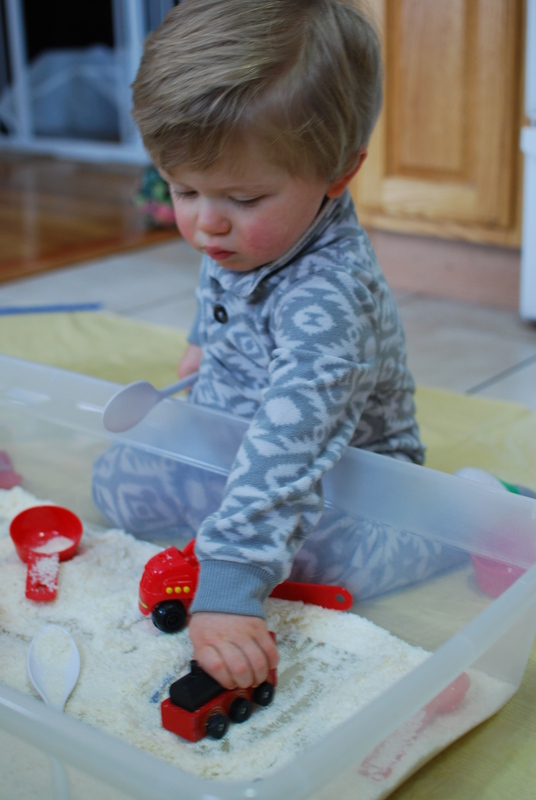 My husband did – and it was his first sensory bin! Go Daddy! I wasn’t home, and I guess Lil’ C wanted to do some pouring. My husband has watched me plenty of times in the process of setting up a bin, starting with dumping out my shoes on the bed and stealing the container. 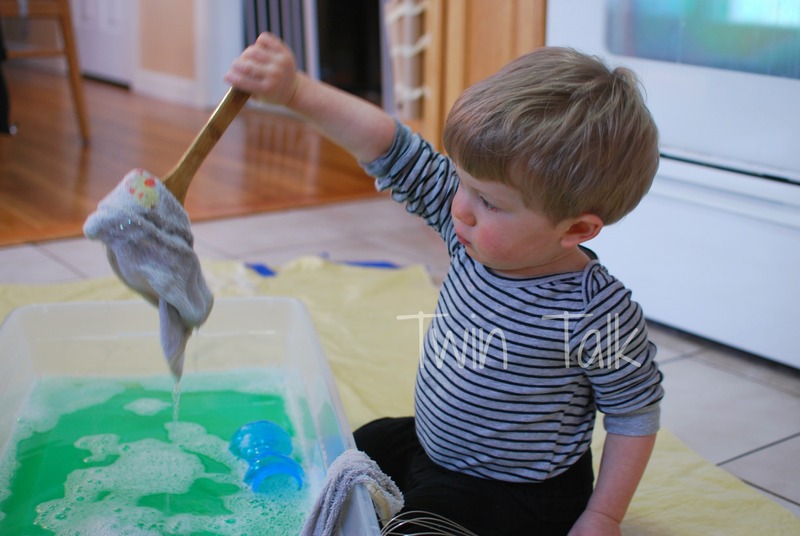 He threw in some tools, a few old washcloths, soap, and green food coloring. Then, thankfully, he grabbed my camera. Another successful sensory bin! As usual, the twins got right to work. Out of all the bases we’ve used in our sensory bins so far (water, potato flakes, beans, and rice), water is definitely their favorite. 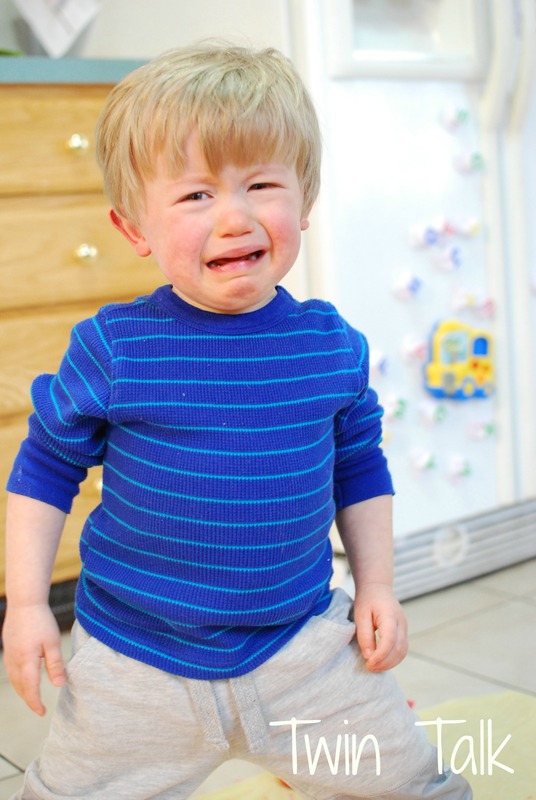 It’s also one of my least favorites, as it’s guaranteed to soak the children and then you have to deal with mopping the water up and getting new clothes. But still, it’s worth it once in a while. 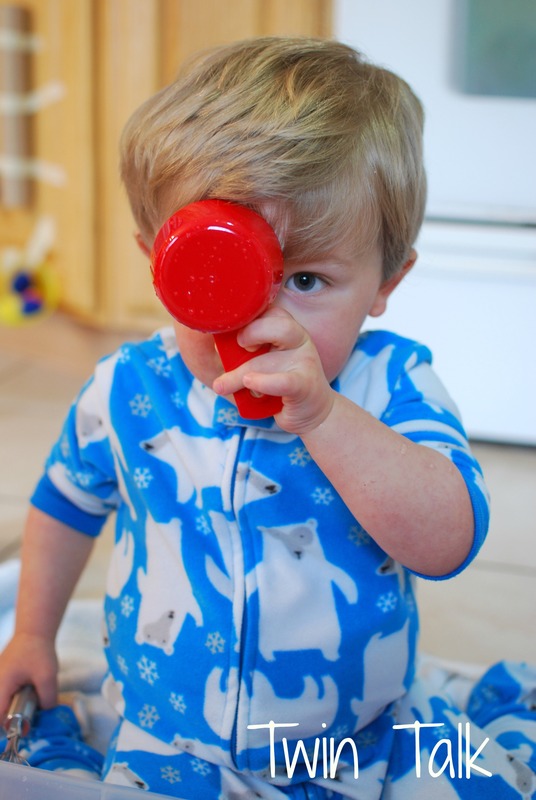 B just loves scooping and pouring. He’s been doing a few different pouring activities lately (more on that soon! ), and really – he could just transfer water/rice/beans all. day. long. 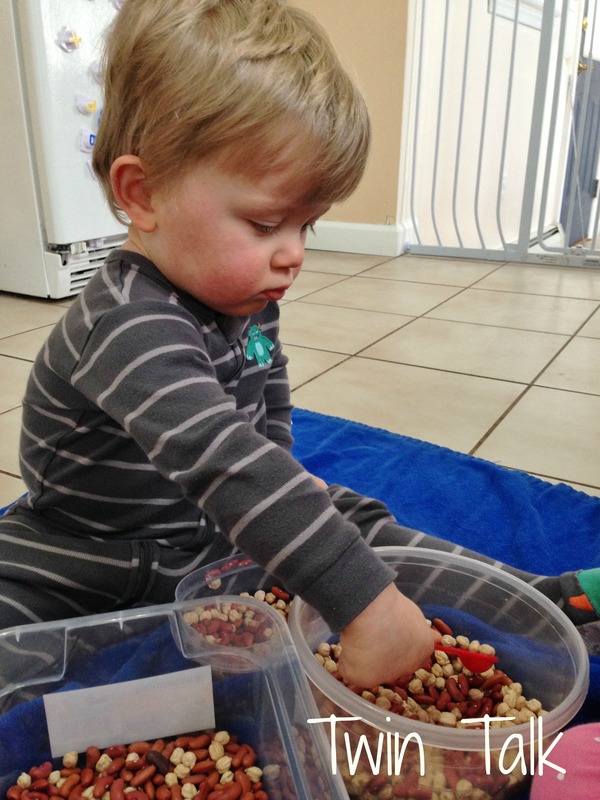 He is so serious about his sensory bins – he concentrates super hard and is quiet and focused. 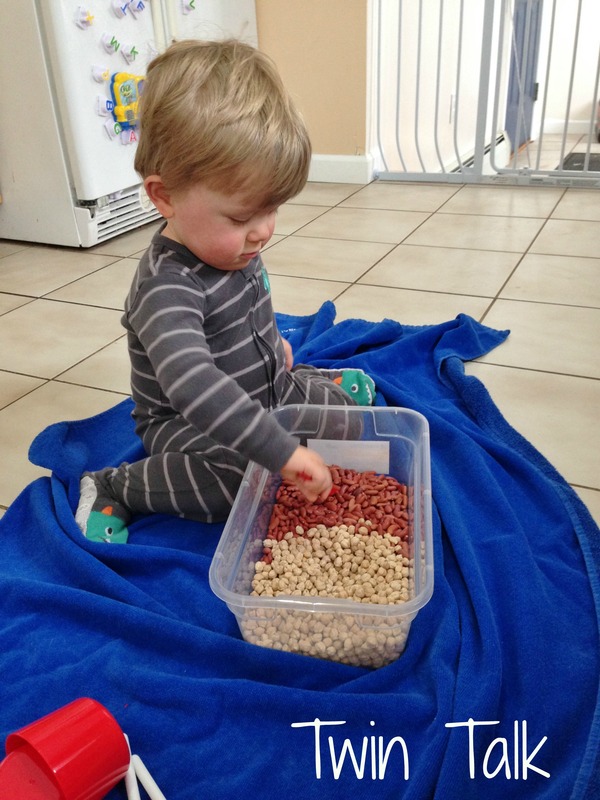 I’d say sensory bins are one of his very favorite things to do. 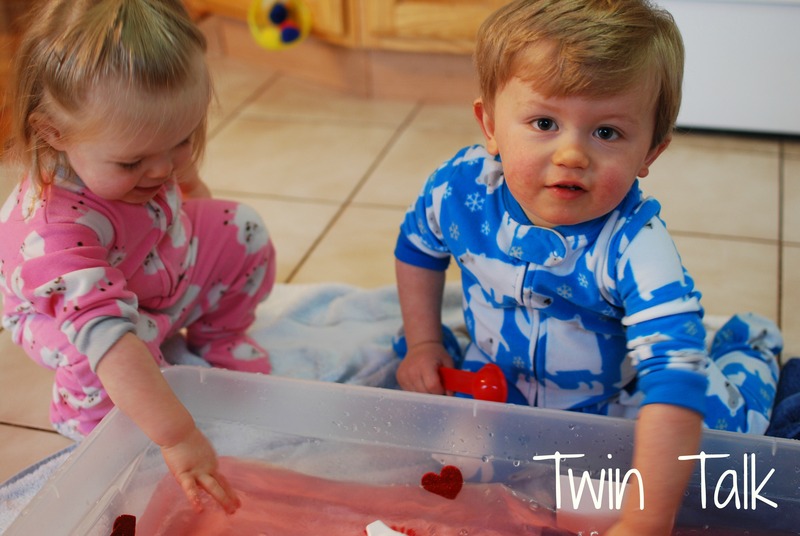 This was the first time washcloths were incorporated into a bin, and I’m glad my husband thought of it – it looks like the twins enjoyed playing with them. And really, it makes perfect sense: you can fill them with water, squeeze them out, watch water drip, scoop them up, and practice washing the tools. 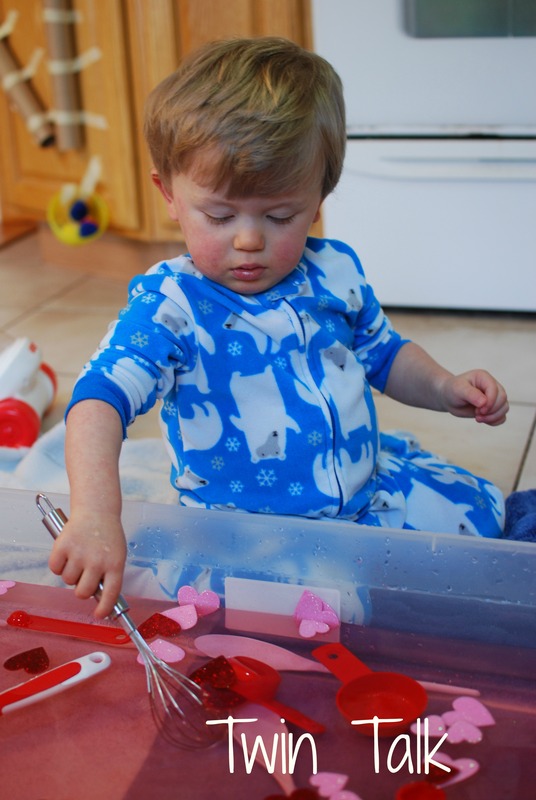 Great for fine motor development and strengthening hand muscles. 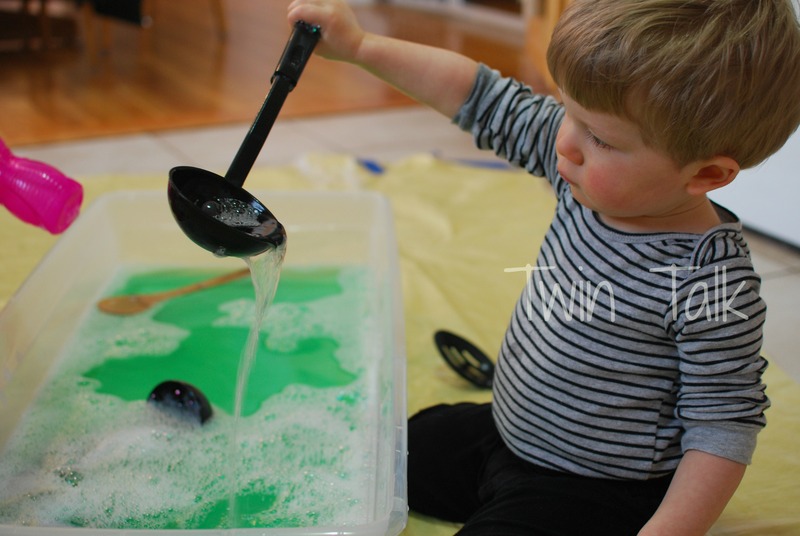 My husband gets home before me every Wednesday afternoon, so I’ll be curious to see if he found this fun and successful enough to start doing weekly sensory activities! Lately, I’ve been on a wild ride. One that I’ve created. See, when I get excited about something new – I focus on that one thing exclusively for weeks with giddy anticipation for the creation of whatever I’m doing. 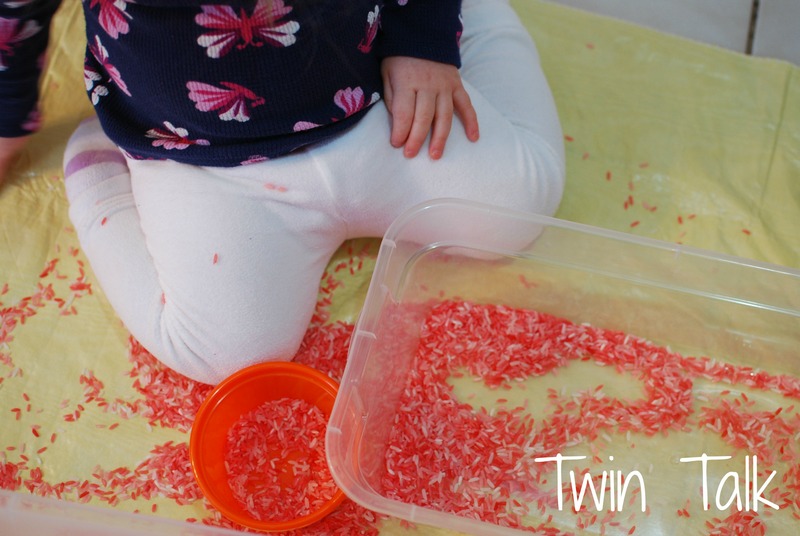 It started last summer, with DIY sensory boards and a spaghetti sensory bin because – I was on maternity leave, and why not, it would be cute to watch. Then it took off from there. 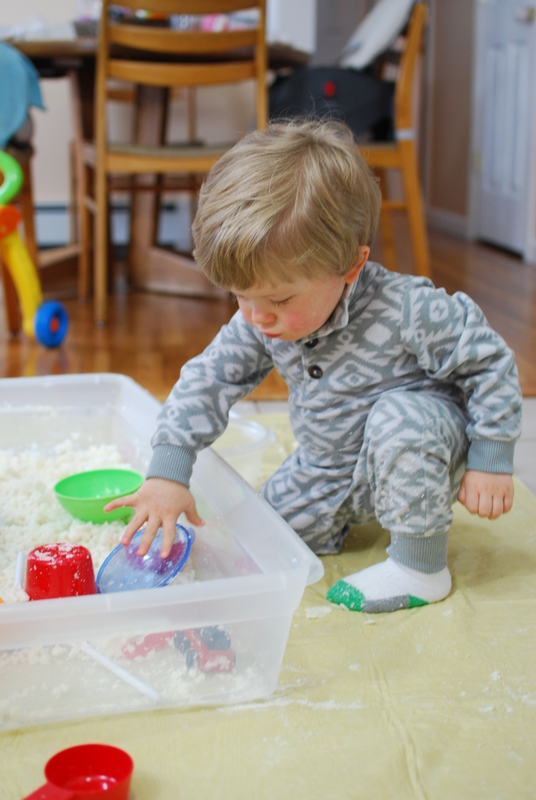 I found myself reading about sensory bins, learning towers, and skills that teach toddlers independence. B, throughout his tantrums, took a liking to all of those things and I realized, we have the need in my house. The same old toys and free play all day won’t work for them, especially B. He needs stimulation, he needs a variety of experiences, and he needs to do things on his own. 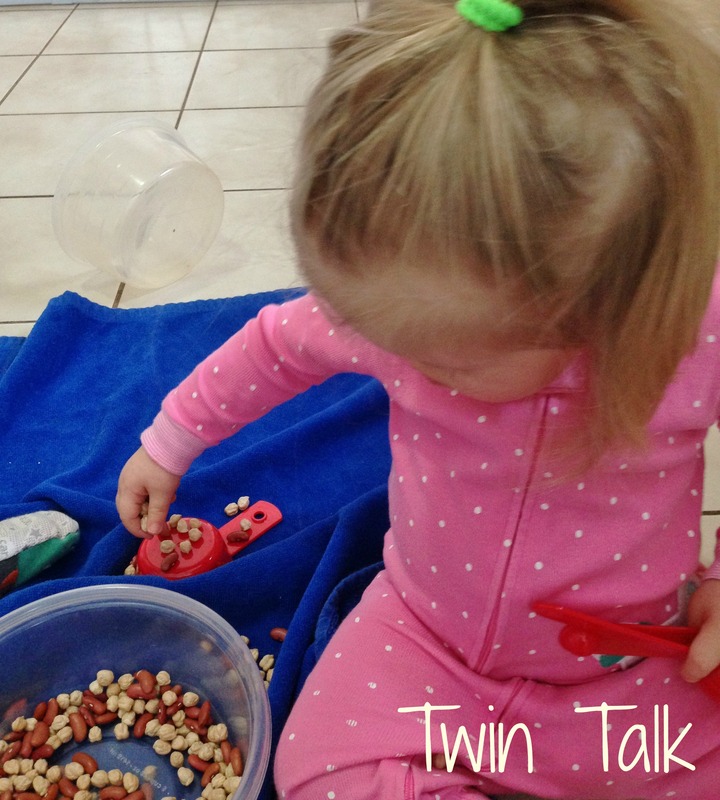 I found myself drawn to toys that let the twins explore on their own and figure out concepts independently, like our treasure baskets and sensory bottles, rather than those toys that did all that for them. 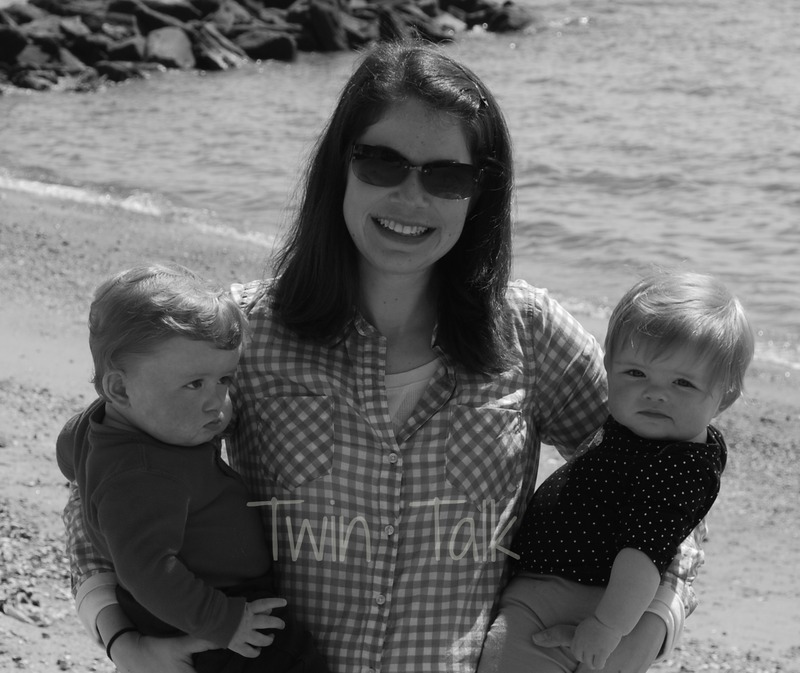 Then my blog took a turn, focusing on activities and crafts, because that’s my life at home right now – that’s what the twins do. I don’t know what direction this blog will go in the future but it’s my hobby and I enjoy it. And whatever the twins are interested in, I’m interested in. I made buckle pillows and zipper boards (posts coming soon!). I got a sewing machine for Christmas. I got so pumped about all these little things I couldn’t sleep at night. I even got my husband into it, as he’s still making those learning towers (they won’t be done until spring, unfortunately!). And then, I stumbled upon the Montessori Method. I’m not the kind of person who throws all the eggs into one basket – there are many correct ways to do things. HOWEVER. 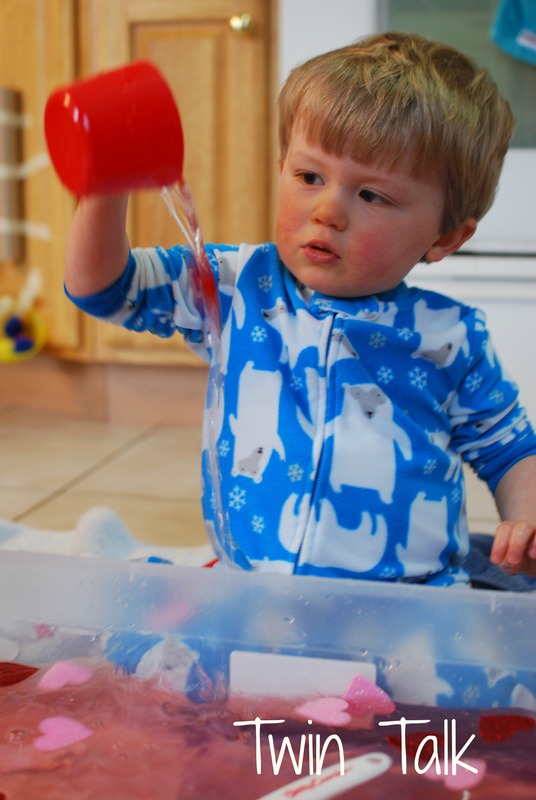 I knew nothing about Montessori, except that it was an expensive preschool. I still don’t know much about it, so this post isn’t about that. 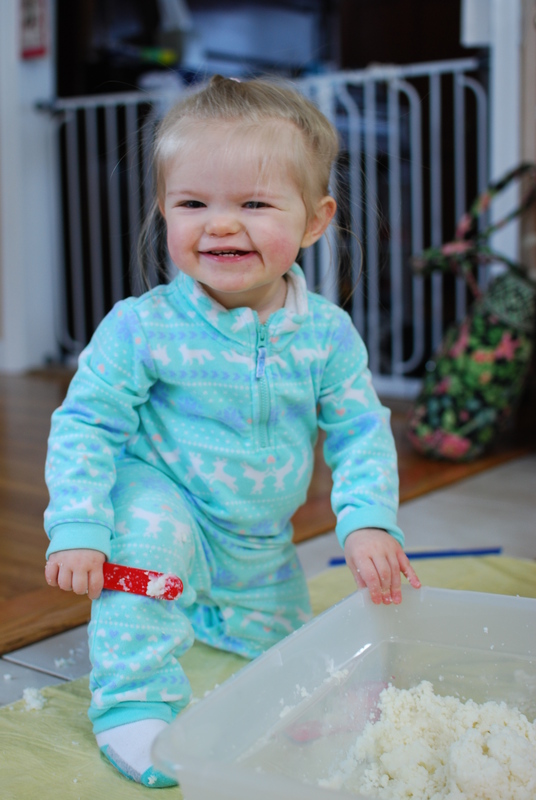 But what I have found is that everything B needs, everything that my husband and I believe in (independence at a young age, discovery, problem-solving, etc)….matches the Montessori method, almost to a T. We had no idea. As I read more about it, I’m really in agreement with so many of the Montessori concepts. 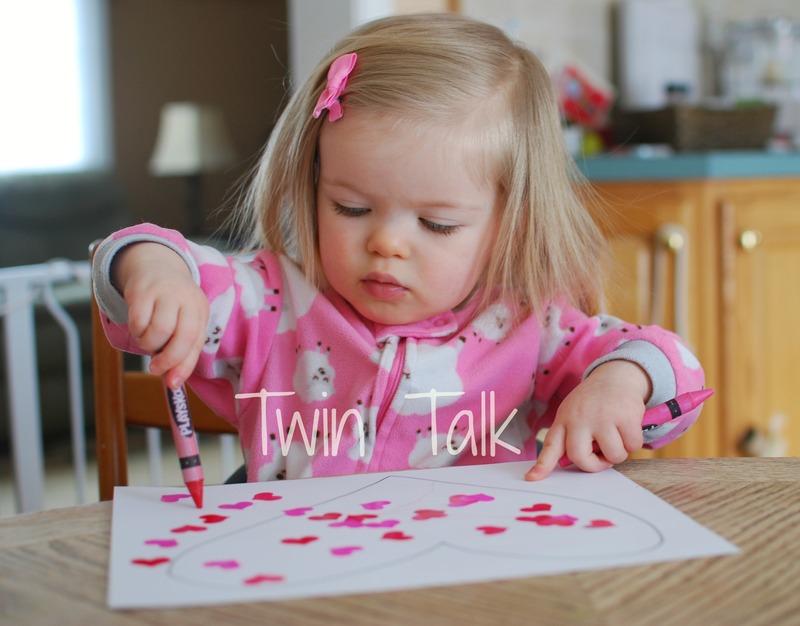 My twins are only 19 months; they aren’t going to preschool for quite a while. 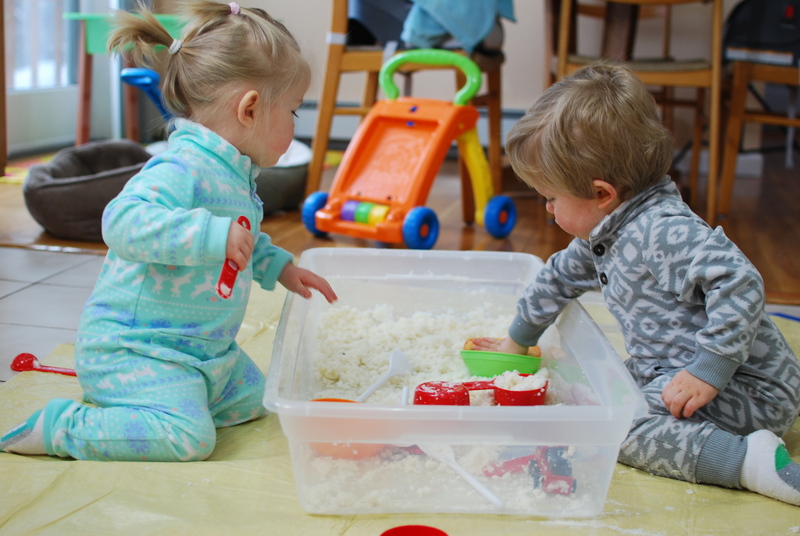 So I wanted to implement something at home that resembled “preschool learning” because the twins love to learn new things. Since I’m focusing mainly on cheap, simple toys (which typically do fit within a Montessori-type activity), I hosted a Busy Bag Exchange back in December (another future post). The bags were great but I wanted more. 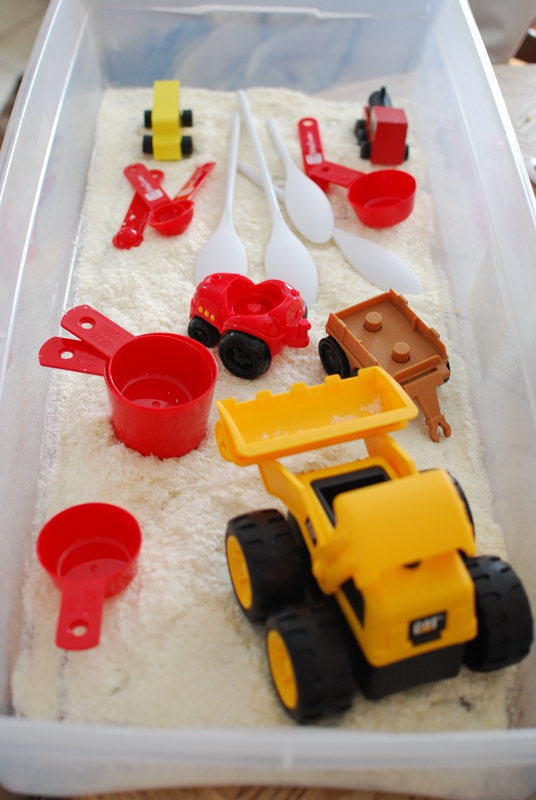 So just recently, through a Montessori lens, I discovered tot trays. And fell madly in love with them. As far as I can tell, “Tot Trays” were coined by Carisa at 1+1+1=1. Her website is loaded with ideas – more than I could ever search through in one night. But the idea is quite simple, and very much like a busy bag. 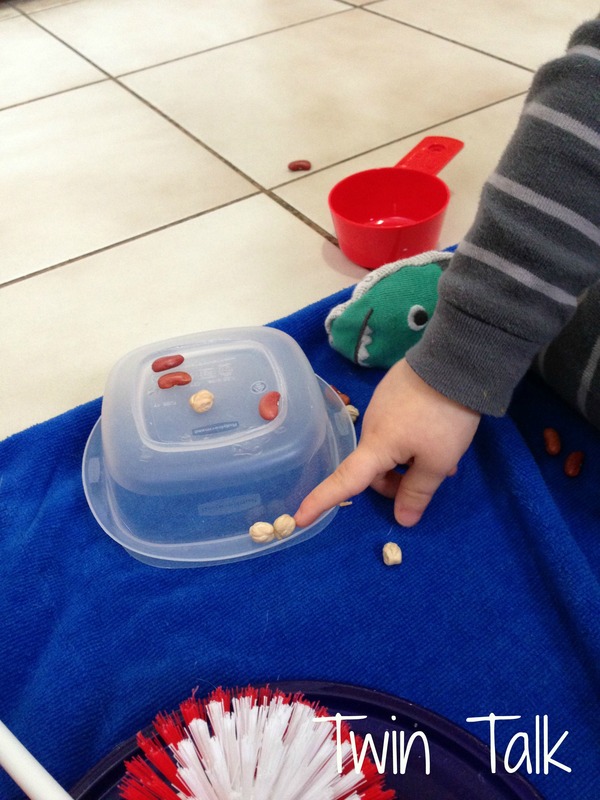 Basically, the child does an activity; a simple, cheap, educational activity on a tray. I just bought trays but when I tried tot trays for the first time, I didn’t have them and used a cookie sheet instead. The activities are not meant to last hours and hours (though bonus points if they do!) 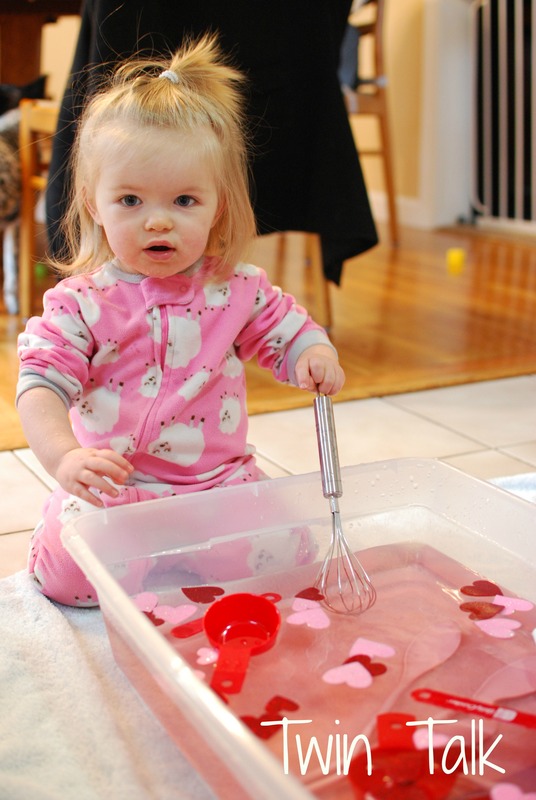 – they are short activities that reinforce skills – everything from math or language arts skills to practical life skills (like practicing pouring water into a cup, or picking up things with tongs, or scooping with spoons). It can be anything really, so long as it fits on a tray. It’s not complicated and it doesn’t need to be over-thought. 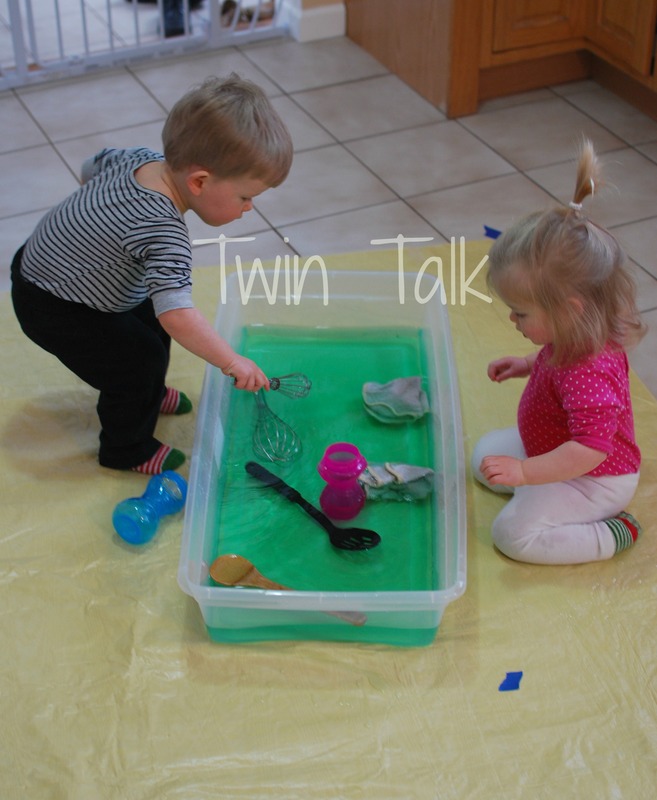 Many people do tot tray activities without knowing they have a name. The idea with the tray is that the child will be responsible for it. 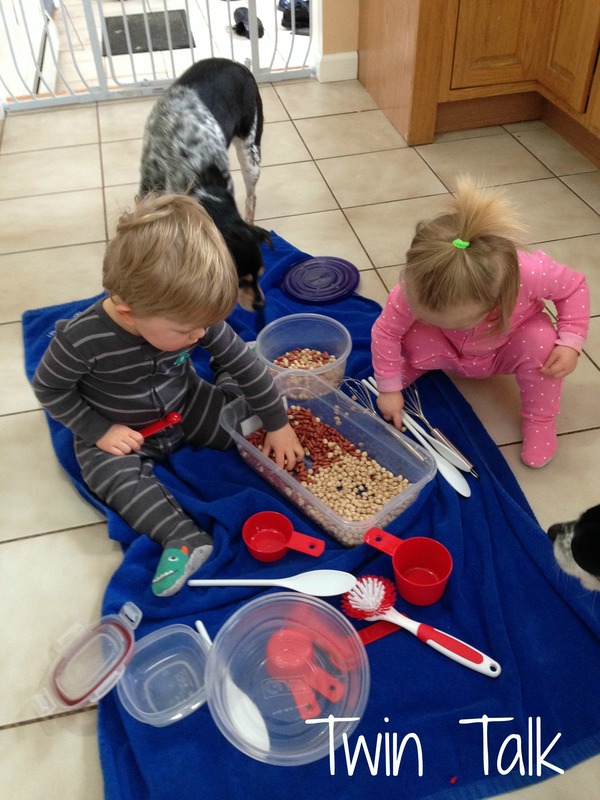 As soon as they are able, they will carry the tray with the activity on it over to the floor or a table and return it when the activity is over. From a practical standpoint, trays have raised edges, and raised edges keep messes from going everywhere! I just adore them. A few weeks ago when it was (shocker) snowing again, we needed something different and quick after nap. I decided to implement our first two tot trays, back to back. 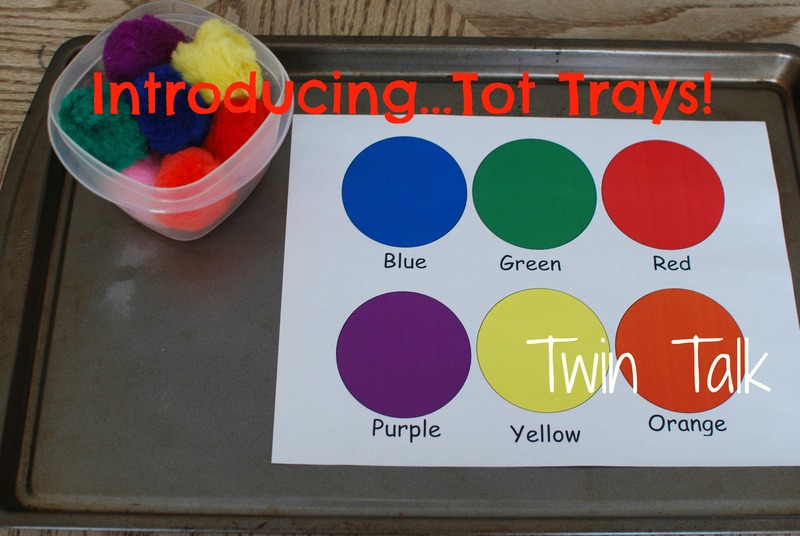 First, we started with a color matching tot tray. I printed out the color sorting mat from here, grabbed an old cookie sheet and the large sized pompoms I already had. After realizing I only had one cookie sheet, I ended up giving the babies their coloring mats on the table with a container of pompoms for each of them. Their only job was to take the pompoms and match them to the corresponding colors on the mat. They did it in about two seconds. I don’t know if that’s good or bad! That’s the thing with tot trays – I mean, I obviously started them with one that was not a challenge for them, which made the activity short. I would imagine the goal is to challenge them at least a little bit. 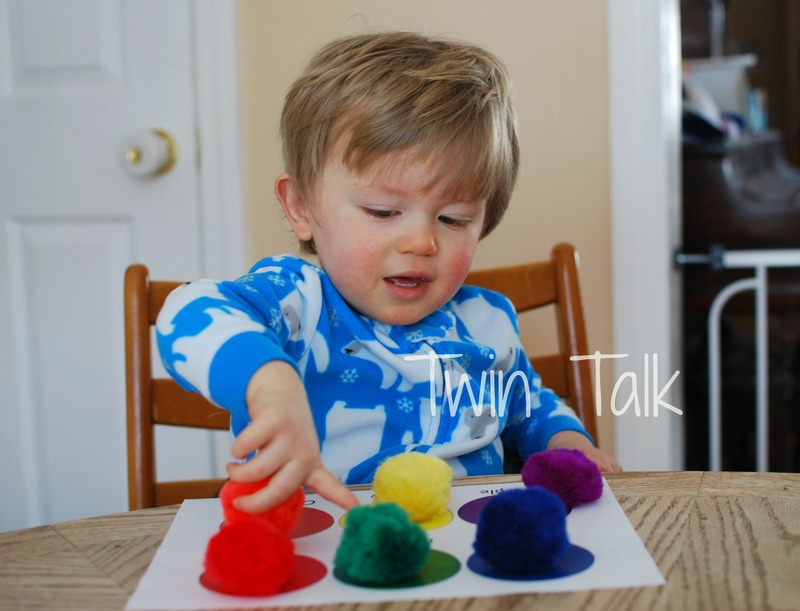 I love the many skills being applied here – knowing the colors, but also identifying letters, feeling textures, and the fine motor skills necessary to place pompoms on a small circle. B was especially into this tot tray, and kept trying to get the pompoms to stick to the paper. (I added pink, white and black pompoms at first because I knew they knew those colors – but when your mat doesn’t have those colors on it? Yeah – don’t do that. Lesson learned!) B practiced saying the colors a few times. And that was it for our first tot tray! Luckily, I had one more planned. I grabbed two sheets of plain paper and as this was around Valentine’s Day, I drew a big heart on each paper. 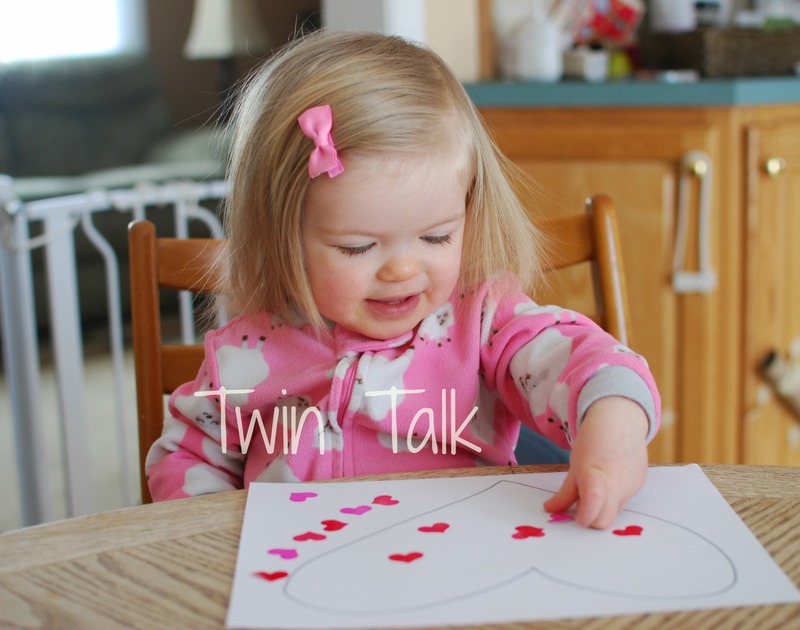 Then, on the “tray”, I gave the babies a sheet of heart stickers and two Dollar Tree crayons. So simple and so cheap! My kind of activity! 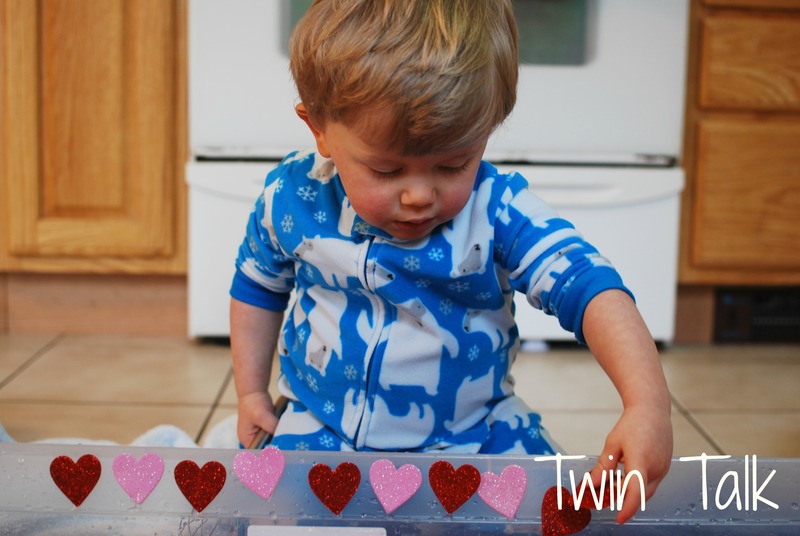 I tried to get the twins to put the stickers “inside the heart”. That didn’t work out exactly, but that’s okay. C was especially into this tray. She is madly in love with stickers right now – they both are. I had to peel them off for her but she stuck every one down and then went to town with the coloring. She couldn’t stop smiling through the multiple sheets of stickers she went through! She really had to work her fine motor skills around pulling stickers off my fingers and then sticking them onto paper. This tot tray lasted much longer than the first one, which was nice. When they were done, we hung them up on the slider with our other heart crafts. My first introduction to tot trays was a success. I’m not sure how I’m going to post about them and organize them here on this blog, but I plan to do many more tot trays with them in the future. Next up – learning to carry a tray! 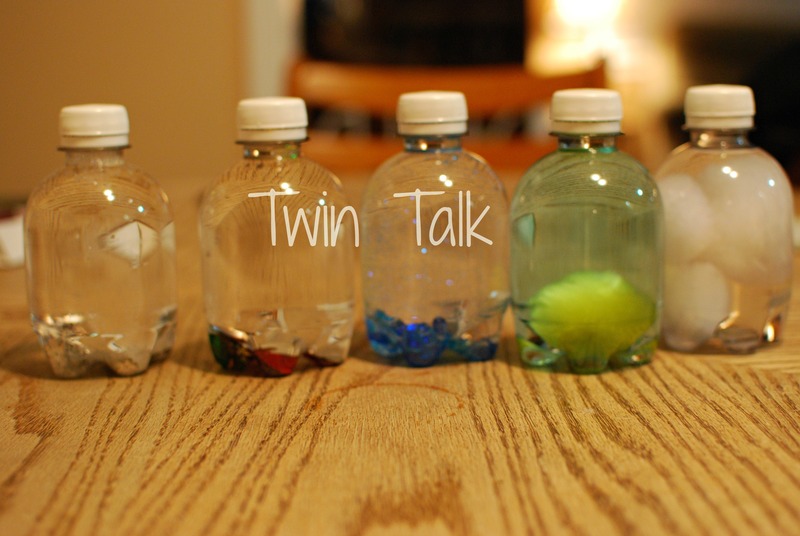 On a side note, I won’t have a blog post about this one but my nanny made amazingly adorable weather sensory bottles. This picture is not my best work, but the bottles demonstrate “snowy”, “windy”, “rainy”, “sunny”, and “cloudy”. 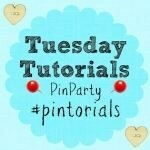 I’ve just set up a Facebook page and there you can find the link where my nanny found the idea! With today’s snow day (our 4th snow day in the past few weeks! 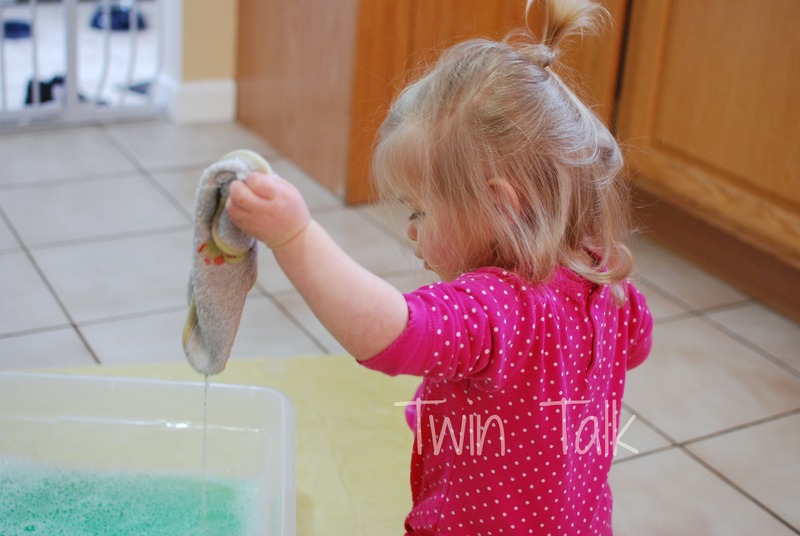 ), I gave the twins yet one more sensory play opportunity. 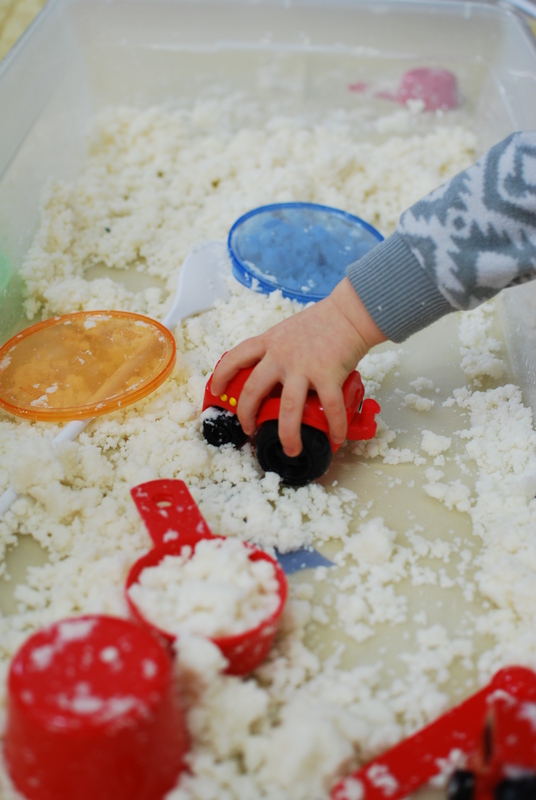 I’ve been dying to see how the 18 month olds would do with rice, and since we’ve recently played in sensory bins filled with water, potato flakes, snow, and dried beans, this seemed like the next logical step. As I’ve mentioned many times before (and hope to have a post coming soon), my son B is extremely curious/opinionated/strong willed and most of all, sensory stimulated. He loves textures and music, sounds and sensations. Sensory bins were made for him. 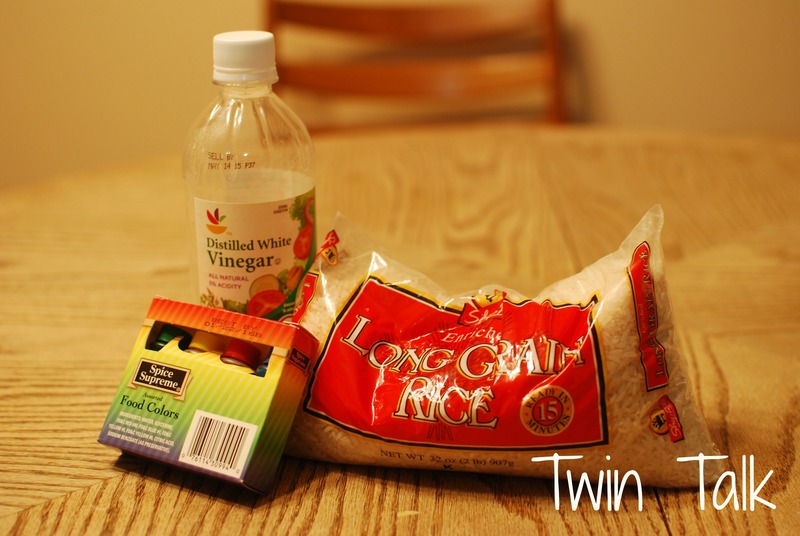 Gather your supplies – white long-grain rice, food coloring, and distilled white vinegar. You can also add extracts (as I did), but that’s totally optional. 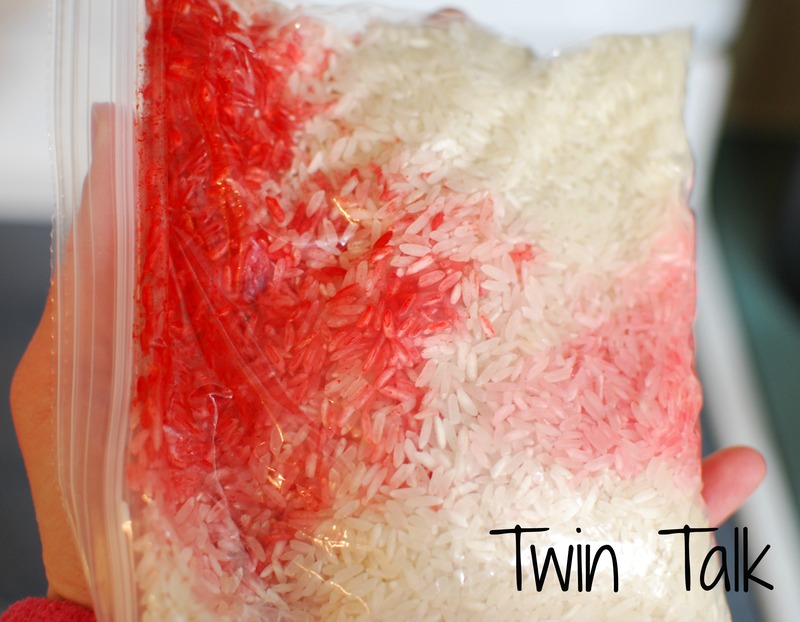 There are many recipes out there, but in keeping with my DIY activities’ theme, I wanted coloring rice to be easy, quick, cheap, and also safe for mouths. I used Learn, Play, Imagine’s recipe. Because my sensory bin is large, I decided to make a double batch. 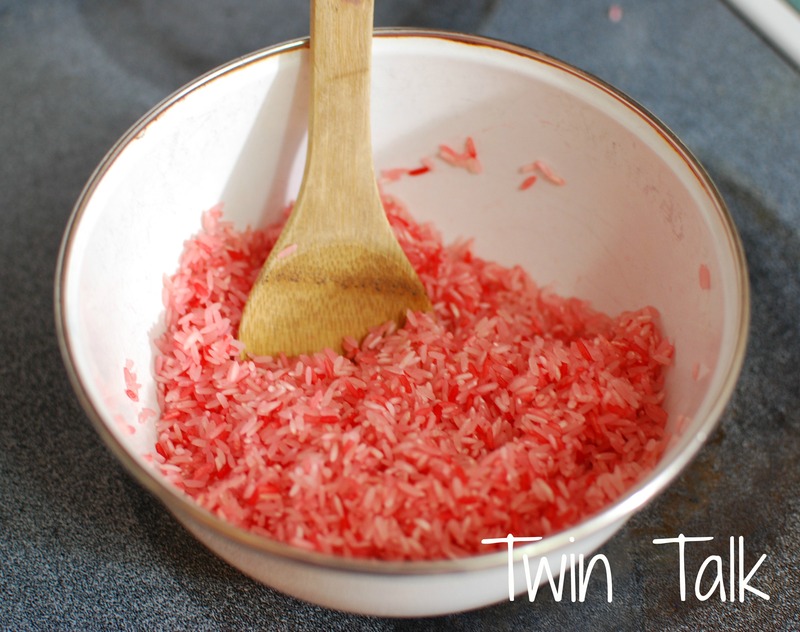 -PINK: Two cups rice, 5 drops food coloring, 1.5 tbsp. white vinegar. Now because I was feeling extra crafty, I decided to add a few drops of peppermint extract to the rice. Extracts go a long way; not much is needed. Without it, the rice only smelled like vinegar if you deeply inhaled the rice (which isn’t probably what you would be doing anyway). With the extract, while we all played in it today there was a nice, faint smell of peppermint. It wasn’t overbearing. I’ll definitely use other scents with my rice in the future. 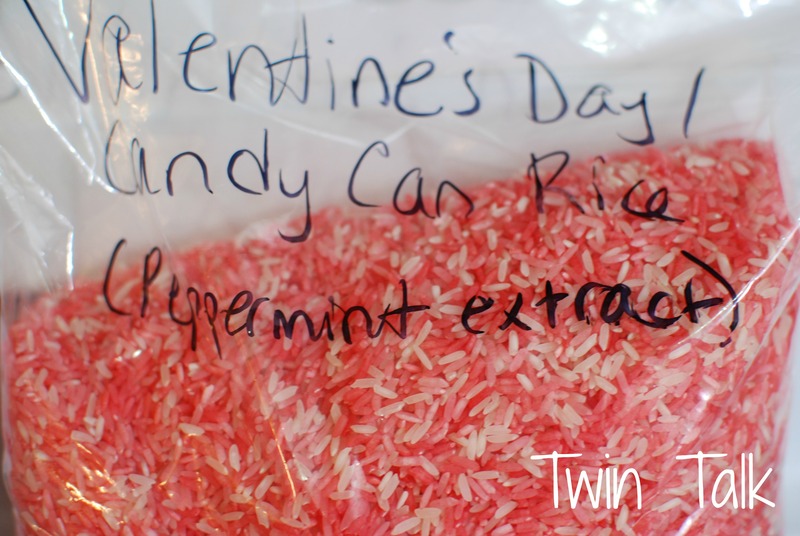 I’ve now decided that this pink mixture I’ve made can be Valentine’s Day themed or “Candy Cane” for Christmas. -Mix together. I started in ziplock bags, but found the color wasn’t distributing well. So after a few minutes I dumped it into a bowl and found it much easier and quicker to mix. I would definitely recommend using a bowl. You do not need a lot of vinegar – play around with the amount, especially if you don’t make a double batch like I did. 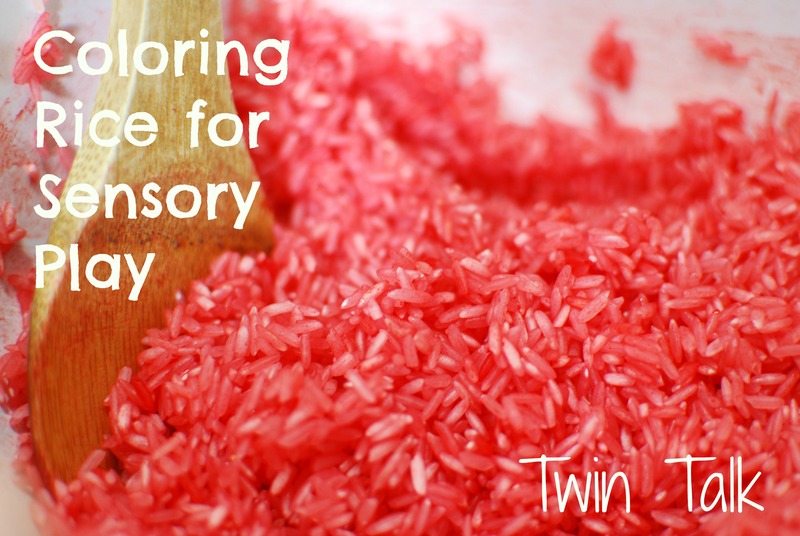 You only need enough to lightly coat the rice, as it helps move the color around. If you find the color not spreading evenly, add a bit more. If you do use too much though, it’s fine; it’ll just take longer to dry. 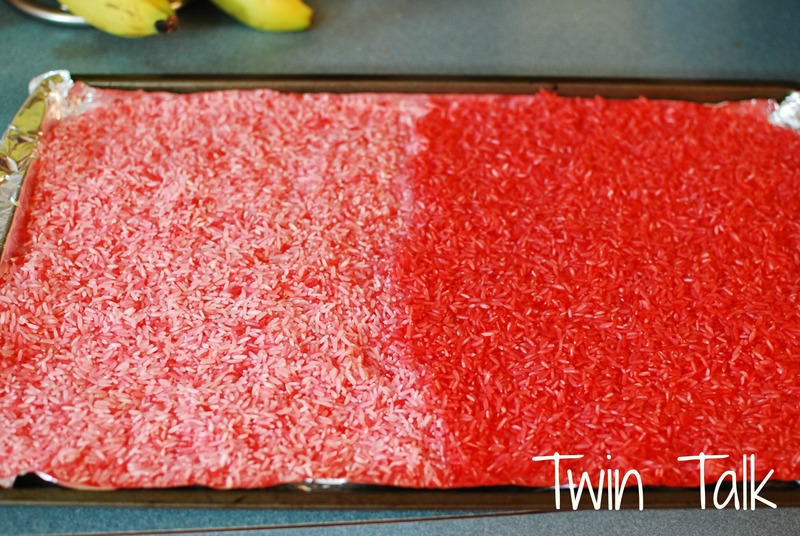 After mixing thoroughly, dry out the rice on a foil-lined cookie sheet. With the amount of vinegar I used, it took maybe a half hour to an hour to dry. It wasn’t bad at all. I imagine in the summertime and with more vinegar it would take longer, so making it the night before you plan to use it would be a good idea. Because I let the rice dry completely, there was absolutely no staining on the twins’ clothes or hands. And I would know, because C was wearing white pants today! Once it’s dry, store it in an air-tight container or like I did, in a gallon-sized ziplock bag. As you can see, I added the rest of the rice bag to the mix for some plain white. It’ll keep for months! Play around with this – add your own colors and scents. The process of coloring rice took me a total of 10 minutes and cost me nothing as I had all the ingredients in my house already. A free, fun activity that would kill lots of time in an otherwise cabin-fevered day. So today was another day in what I am now believing is the “18 month sleep regression”. The one nap the twins took was early and short. They barely ate lunch. They were just blah. And for B, who thrives on these sensory activities, he didn’t give his usual focus and concentration on this bin. I don’t think it was the rice though, I think it was his mood. They did get right down into the bin and immediately shoved their hands in it, grabbing the rice and letting it drop all over their clothes. As usual, I first taped down a cheap vinyl tablecloth to the floor for easier clean up. Originally, I let the dogs hang out with us. I typically do. But with the peppermint scent and the fact that it was rice, the dogs started licking their way around the mat, so I banished them to the living room where they could watch us without eating our bin. Puppy dog eyes were tried. It didn’t work. Surprisingly, (or not, with these lack of naps), the twins started to seem a little bored after only 15 minutes or so. These bins usually give us a good hour of solid concentration before anyone gets antsy. 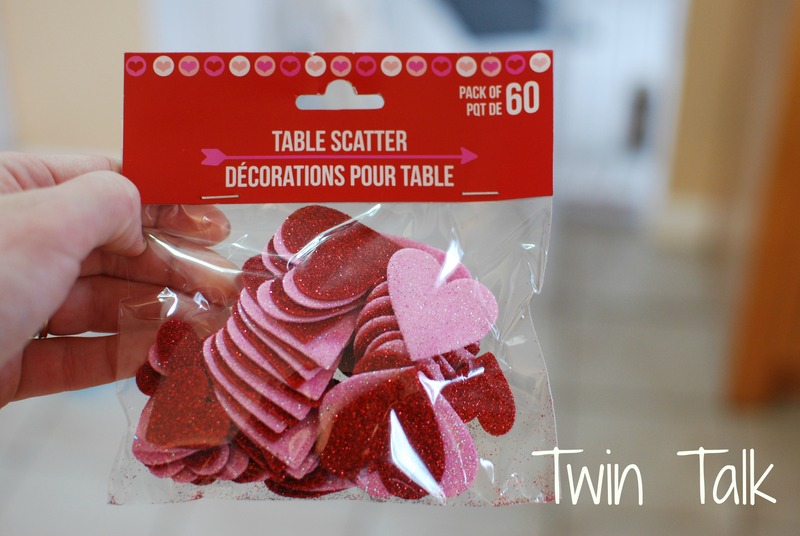 I decided to bring out my next trick, the same hearts we used in our Valentine’s Day Soup water bin. And then I made a crucial parenting error. 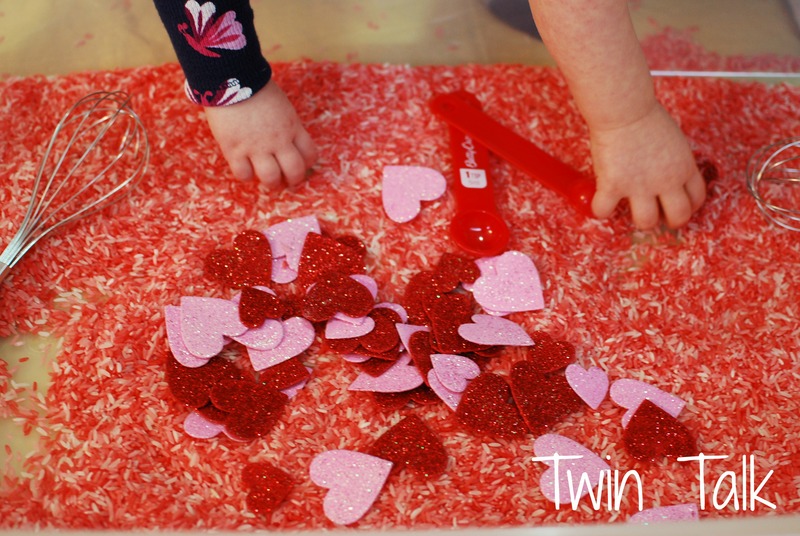 I got all excited about the hearts and had this idea that I would bury them and the twins would dig them up. Except I jumped right in to bury them before the twins even had a chance to play with them at all, and being overtired, B was very upset. He started in on full meltdown mode and I thought for sure the activity was over. After a few minutes though, he did calm down and came back to play. I’d even say he enjoyed himself, as he typically does. And he proved his love for the hearts after all, even after I tried to hide them. We still managed to pass about 45 minutes of our day! The set-up rating: A 1, unless you are coloring rice, in which case maybe a 4.Once it’s colored, dump it in the bin, add tools and it’s ready to go! The cost rating: A 1. You would probably have these things in your house already but if not, they could be purchased at the dollar store. I will absolutely do a rice sensory bin again, though. It was fun – I enjoyed it as much as the twins did. On to the next one! 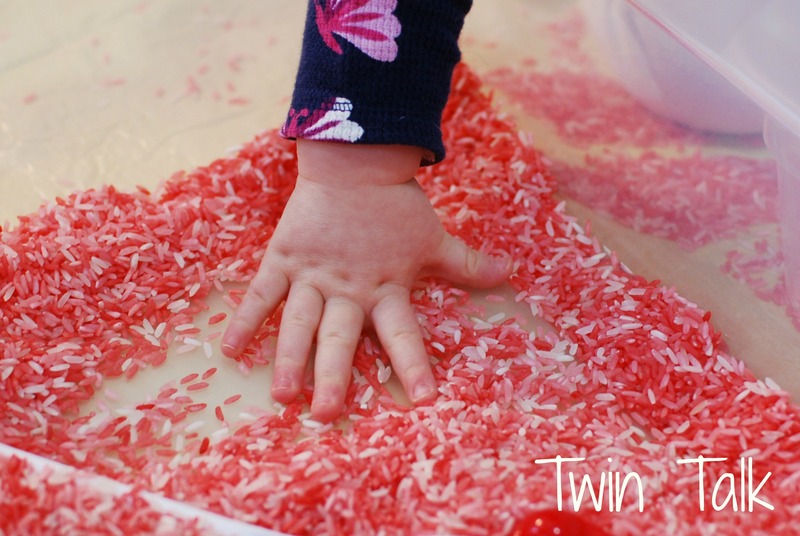 My daily posts about sensory activities might be taking a few days off – in between home-bound weekends and snow days, I’ve had a lot of opportunities lately to engage the twins in some sensory fun. But I’m back to work tomorrow so I won’t be trying anything new with them until the weekend! Wintertime in New England means it’s too cold to go out. And staying indoors all day, every day means cabin fever. So I’ve been on a bit of a personal mission to find different, DIY-type cheap and easy things for my twins to do and play with. 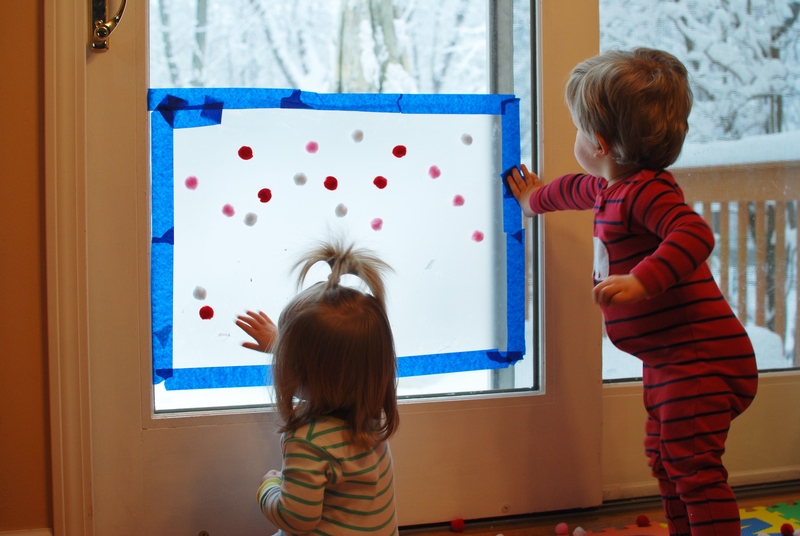 On our first snow day, we did our pom-pom contact paper activity and then we journeyed out into the snow. It was very cold and underneath the snow was a sheet of ice in the backyard, so the twins mostly stood there. They enjoyed the different environment and the change of pace but we didn’t last too long. I took a few pictures and we went back inside. That afternoon, I knew they needed another activity. These naps, as I’ve mentioned before, are so damn short – an hour and a half max (but they sleep 12.5 hours at night..). It’s a long afternoon from 2:00-7:00! 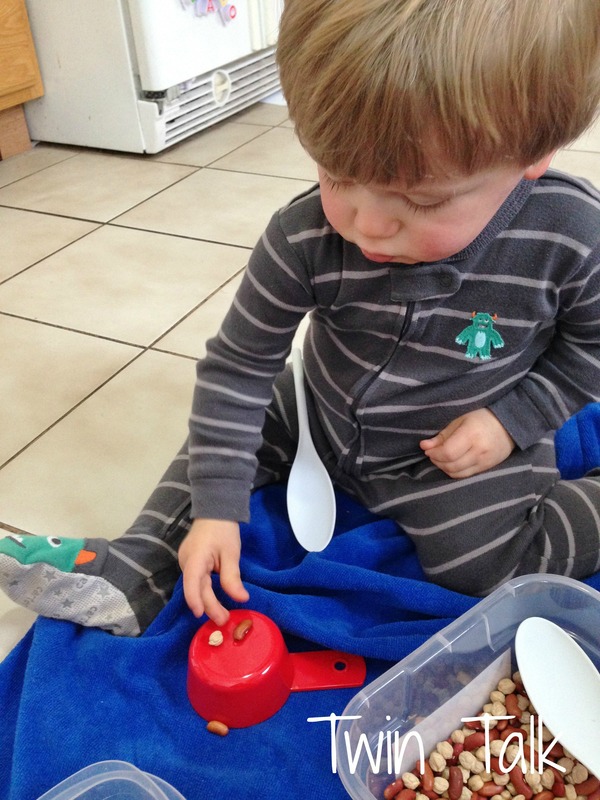 B thrives on stimulation, so sensory bins are his new favorite thing to do. The large storage container I’m using for my sensory bin is actually for shoe storage. In typical fashion in our house, I dump my shoes on my bed while we’re doing the activity and put them back in later! I probably should buy another bin, but for now, this works. 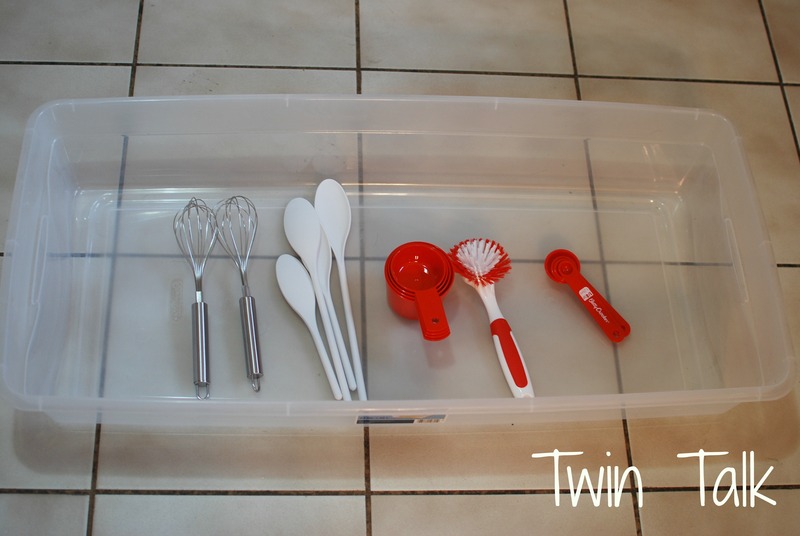 I bought a box of instant mashed potatoes and dug out my small storage container of sensory bin tools – cooking spoons, measuring cups and spoons from the dollar store and a few toys. I first saw this idea for a potato flake sensory bin at The Train Driver’s Wife, but apparently it’s a common bin to do. I put down a vinyl tablecloth I bought at the grocery store for $4 and taped it to the ground, assuming this bin might be a little messy (foreshadowing alert!). As usual, the twins dug right in. The texture of the potato flakes is very dry, almost like sand. It’s easy to scoop and drive trucks through. The twins did some stirring and transferring for a little while. 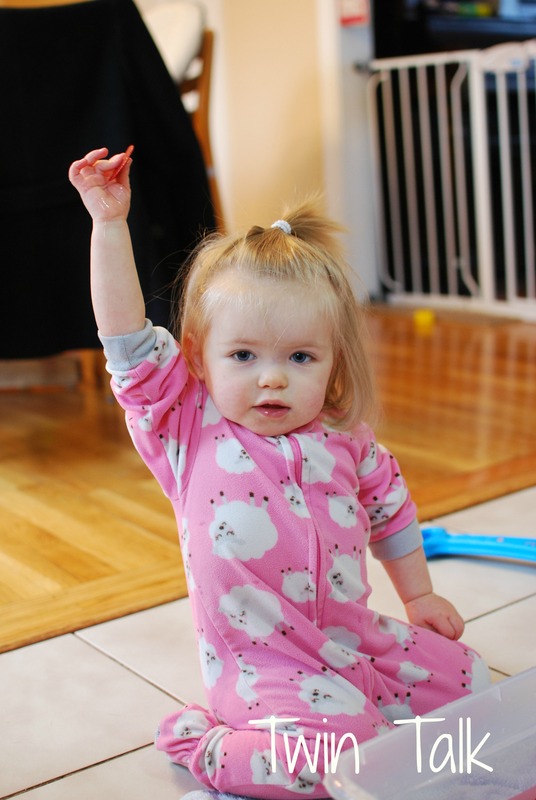 They also found the fun in grabbing handfuls and releasing it, though it wasn’t always over the bin. They started to get a little antsy though, sooner than I expected they would, so I added water and asked them to help me stir the bin. I continued to add water to the consistency I wanted – more “snow” like and easy to mold and squish. 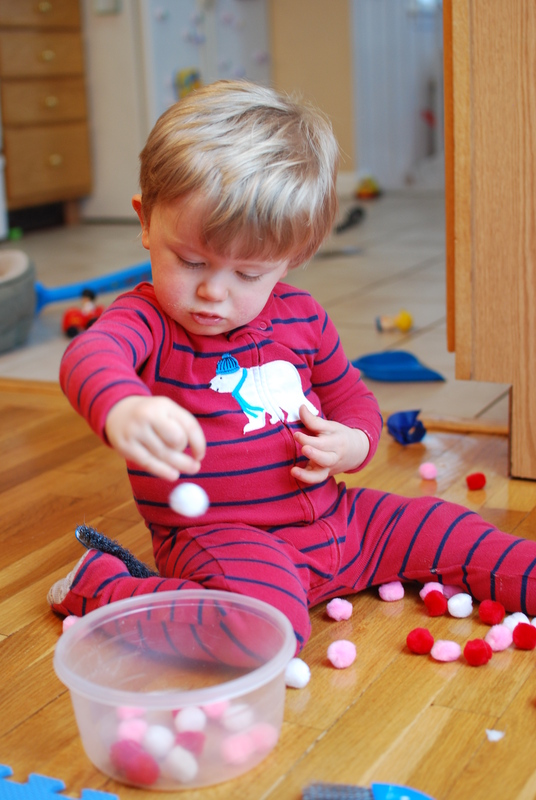 After that, they were able to make little balls and pick them up, pat the chunks down and really explore the texture. 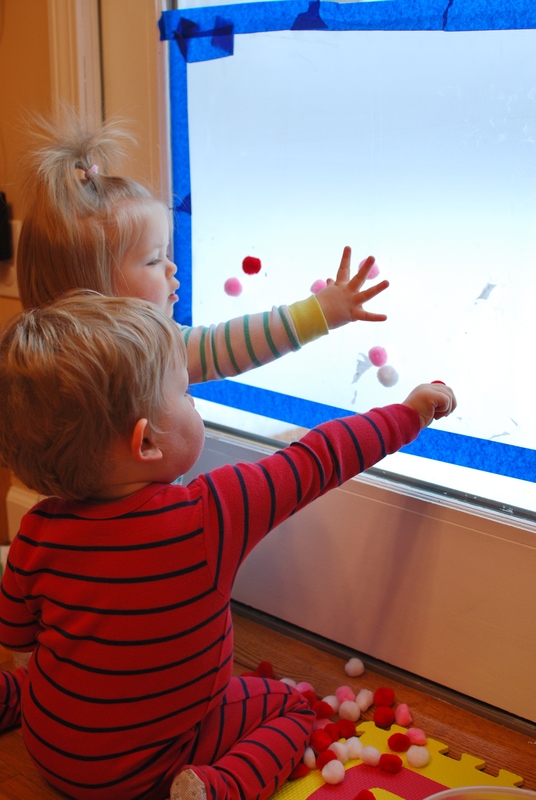 My goal with each sensory bin is to keep them occupied for at least 45 minutes. 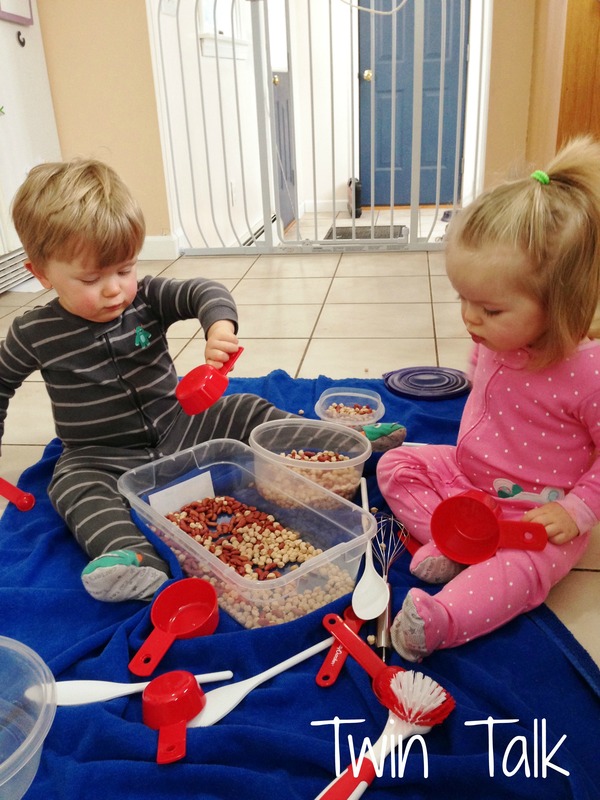 As they started to get bored of the activity, they went into their storage drawer in the kitchen full of their cups and lids and started taking them out and bringing them to the bin. I was a little conflicted for a second because on the one hand, I wanted to keep this bin going. At the same time, each container joining the game would be more clean up for me! Obviously, for all of our sanity, I let them take out some containers. Then they practiced stuffing the containers with the potato flakes and pushing the lids on. I made my goal of an hour. 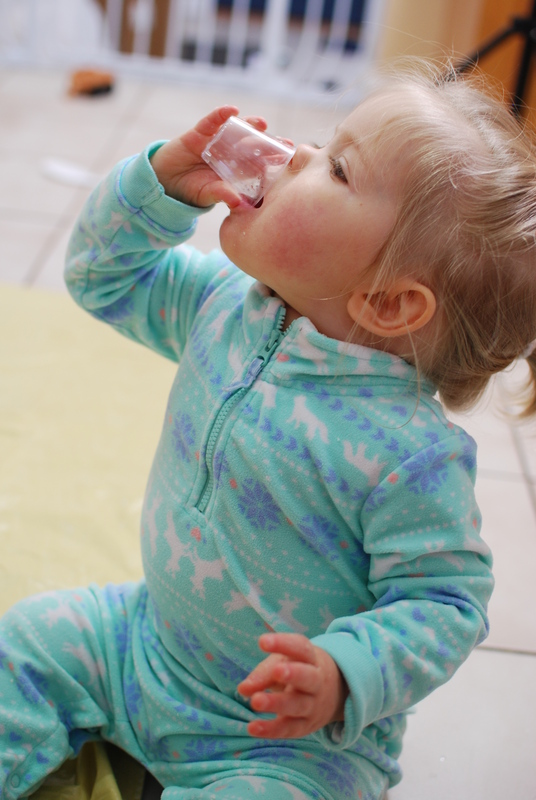 We finished with C learning how to drink from a little tiny cup. The twins had fun. 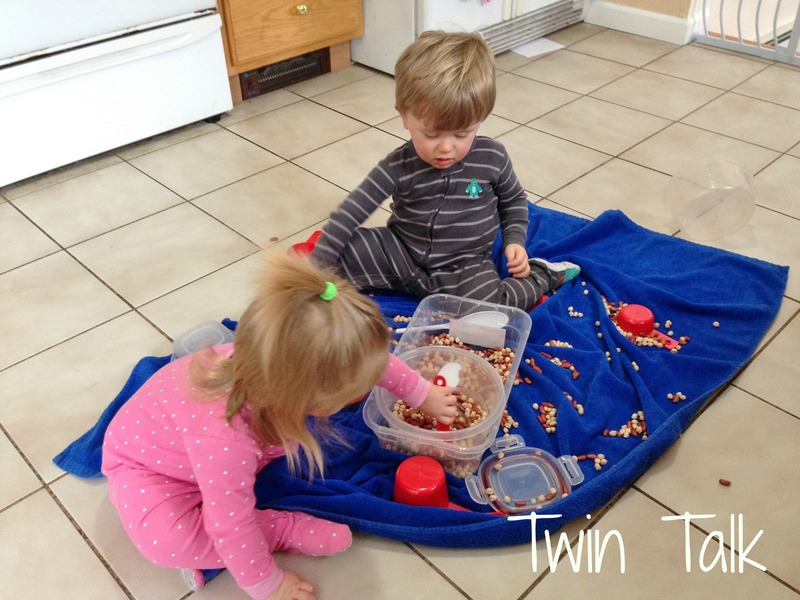 I added it to my growing list of sensory bins we’ve tried. It was super easy to set up and extremely cheap. HOWEVER. The mess factor, from a 1-10, was an 8. First of all, it smells like potatoes and spices. Because that’s exactly what it is. I didn’t mind it, but there was an ever-present odor of food in our kitchen. Second, after adding water and stirring, we essentially made potatoes. If I slapped them on a plate and heated them up, they’d be ready to eat. I expected the twins to taste it at some point but they never did. This is probably for the best though because they both hate white potatoes! 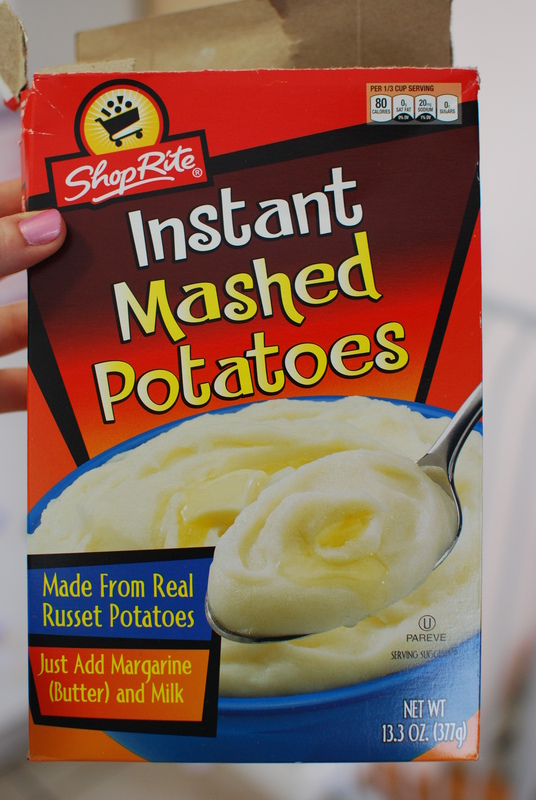 More than the fact that they smelled like and WERE potatoes – it was messy. Even with a large tablecloth, inevitably dry potato flakes and wet potato chunks made their way off the mat. Little feet in socks stepped in them and then trailed them around the house. It was sticky. The dogs had a field day with their tongues doing the job of a mop all over the halls. Luckily we didn’t have any houseguests who would have been in some shock 🙂 And because it was food, each and every storage container, spoon and toy had to be washed. 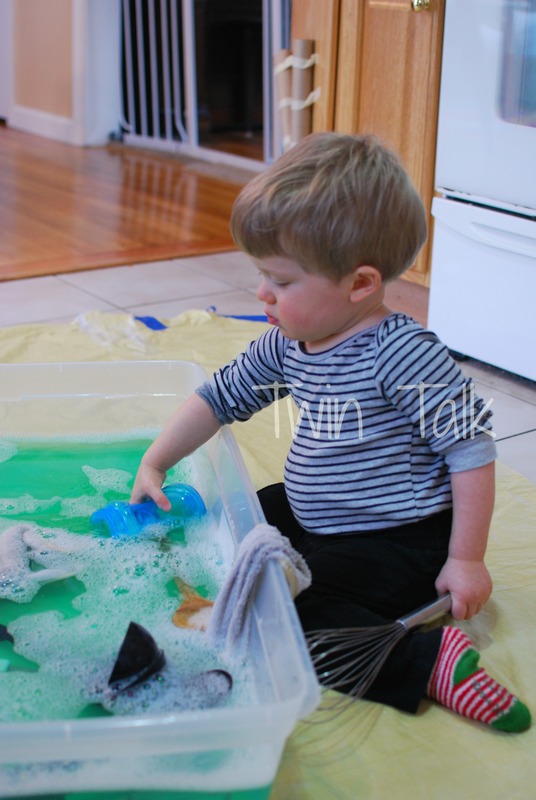 Next time, I wouldn’t add toys because it was hard to clean wet potatoes from them! After I cleaned it all up, I swiffered the floors in multiple rooms. Yesterday was a weekend snow day. 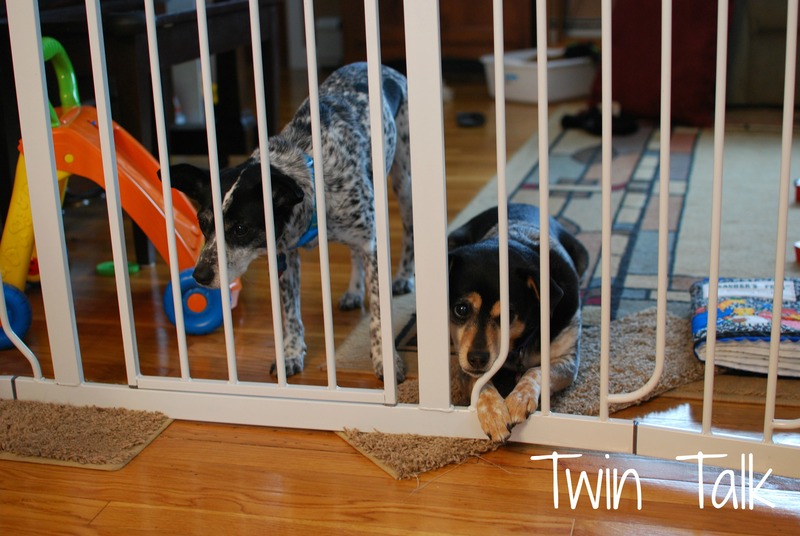 We were all trapped in the house – together! To manage the craziness of two bouncy toddlers, two hyper dogs and two tired parents in a small house, we had to break out the sensory activities. The twins are officially on one nap now, which gives them a lot of free time during the day (yawn for Mommy and Daddy), so more than one activity was needed! I’ll put them in separate posts. All were easy to set up, easy to clean, and best of all – super cheap! 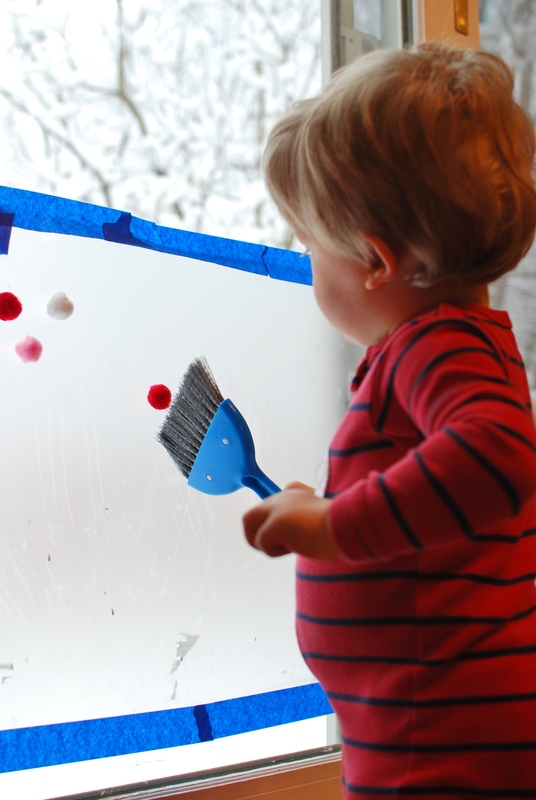 The first activity the toddlers did involved contact paper. I bought the clear kind on Amazon and then discovered the chalkboard version. I’m so excited to use that one in the future! 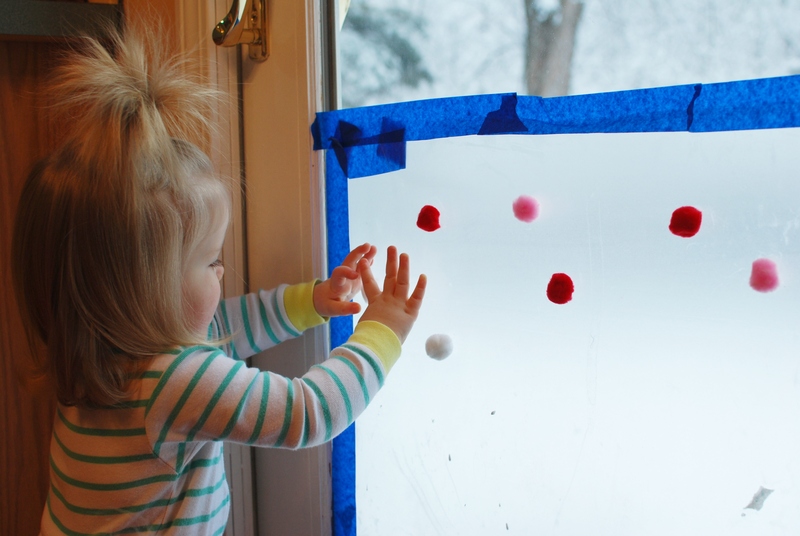 I got this idea from the awesome blog, Allison’s No Time for Flash Cards – the “Pom-pom Sticky Window”. I already had some Valentine’s Day colored pom-poms that I purchased from the Dollar Store and threw them in a bucket. I wished I had two packages.The more pom-poms the better! Stock up! As soon as I stepped away from the set-up, the twins were all over it. B dumped out the bucket immediately and they both scrambled to push the little fluffy dots onto the paper. I wasn’t exactly sure what they would do with this activity or how long it would last. Pleasantly, they were sufficiently interested for about 15 minutes before the pom-poms started to fall off a bit. I don’t know why – perhaps all my finagling with the contact paper took some of the stick off. I thought for sure the activity was done. But after a few minutes, it sprung new life. B found their new little brooms I have stationed next to the sliding glass door, and I asked him to help me sweep up the pom-poms in order to put them back in the bucket. Well, a few good sweeps sent those pom-poms flying and a new activity was born. 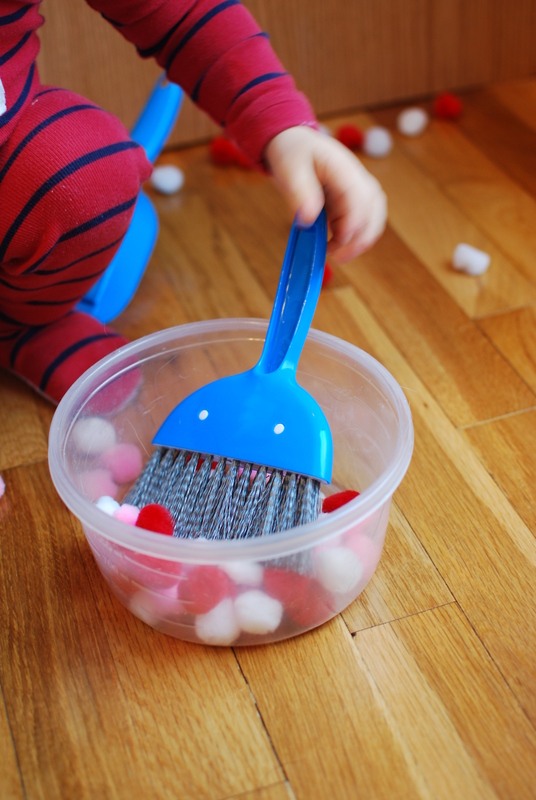 The broom made a fun, scratchy sound as it smashed the pom-poms off the paper! 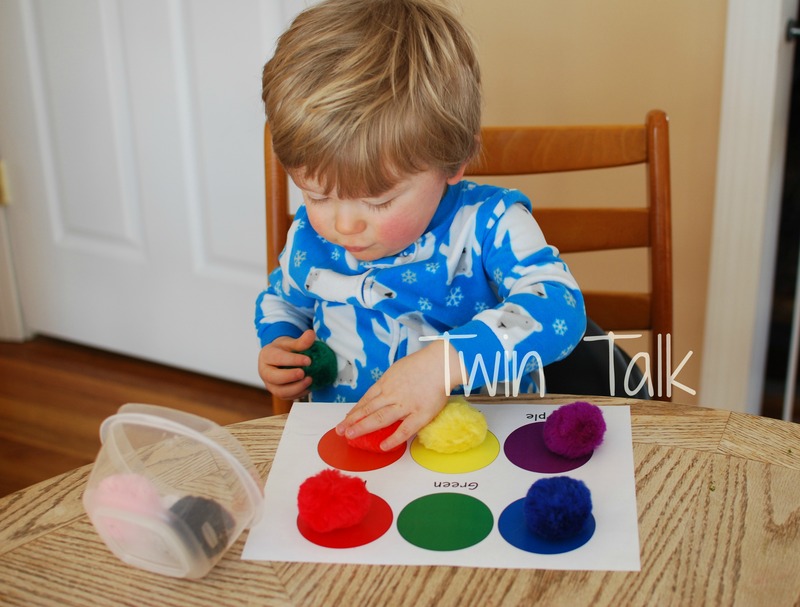 We reviewed colors and textures (“sticky” is a fun toddler word!) and I sang the clean-up song which for now, works every time. I’m sure there’ll come a day when it won’t! A good half hour/45 minutes went by. So simple and so worth the little effort it took to set it up! Mess factor on a scale of 1-10: 2. 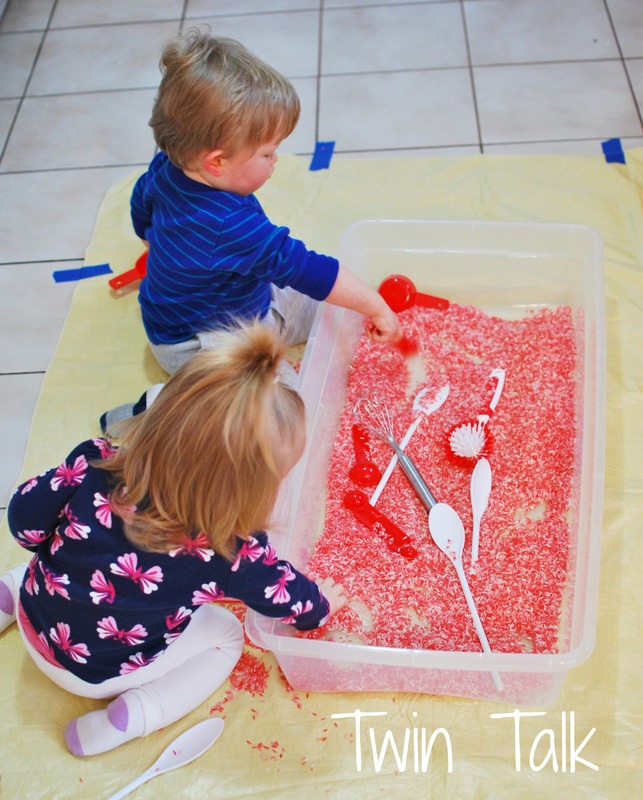 Now that I’m getting more and more into these sensory, DIY activities, I’m always amazed how just when you think the activity is over, kids will find a new way to use the equipment. There’s so much more that can be done that I would never even think of! 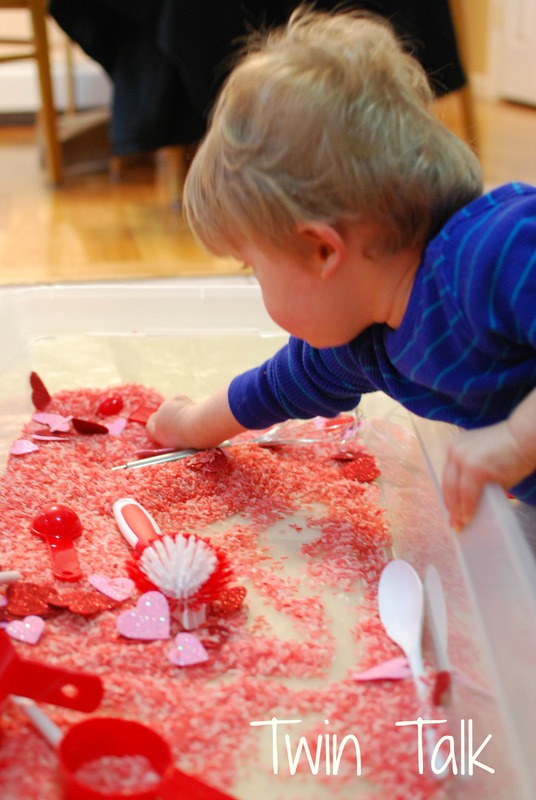 We did two more sensory activities yesterday to round out the snow day, and as I said earlier, I’ll post them separately. Now, there’s a massive blizzard coming our way in a few days. We could be stuck inside for days. I’m on the lookout for our next activity!